Media reports have inflated the insurgency’s strength. A recent Newsweek cover article branded Afghanistan “Obama’s Vietnam,” arguing that the country has been infiltrated by a dangerous enemy that has repeatedly vanquished foreign invaders. 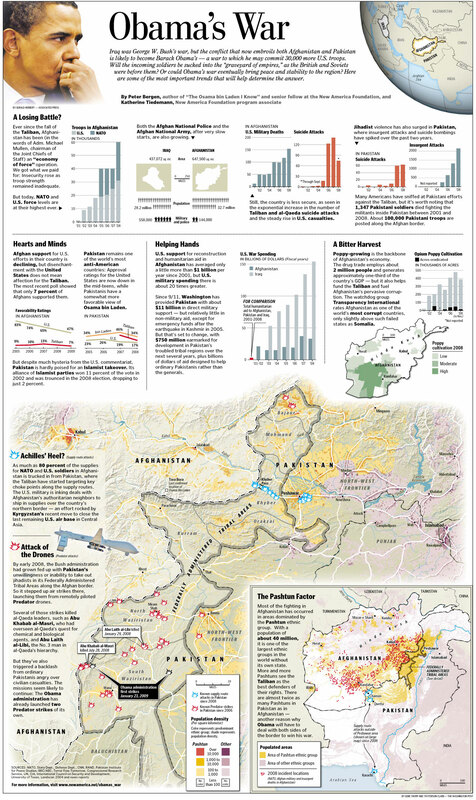 In December 2008, the London-based International Council on Security and Development reported that “the Taliban now holds a permanent presence in 72 percent of Afghanistan, up from 54 percent a year ago.” But on repeated trips to rural Afghanistan, including one late last year, I found that the Taliban control little actual territory. These sentiments are apparent in a range of public opinion polls. Just last week, an ABC/BBC poll indicated that only 4 percent of Afghans support a Taliban government. When asked who posed the biggest danger in the country, 58 percent of respondents said the Taliban. In addition, nearly 70 percent said that it was “good” or “mostly good” that U.S. forces overthrew the Taliban regime in 2001. It’s not difficult to see why. The Taliban subscribe to a radical interpretation of Sunni Islam grounded in Deobandism, a school of thought emanating from the Dar ul-Ulum madrassa established in Deoband, India, in 1867. The objective of senior Taliban leaders is to establish an extreme version of sharia, or Islamic law, across the country, which they refer to as the Islamic Emirate of Afghanistan. In the 1990s, the Taliban closed cinemas and banned music, along with almost every other conceivable kind of entertainment. In Kabul, they carried out brutal punishments in front of large crowds in the former soccer stadium. The Taliban were — and still are — deeply unpopular. Most Afghans don’t subscribe to their religious zealotry, which the founders of Deobandism wouldn’t even recognize. And the rapid collapse of the Taliban regime in 2001, barely two months after the war started, served as a striking testament to the group’s weak foundation. Yet the insurgency, which has engulfed parts of Afghanistan and Pakistan, does not consist solely of the Taliban. It is fractured among more than a dozen groups, including the Haqqani network, led by Pashtun militant Jalaluddin Haqqani; mujaheddin leader Gulbuddin Hekmatyar’s Hezb-e-Islami; Tehreek-e-Nafaz-e-Shariat-e-Mohammadi; al-Qaeda and many others. A bevy of Pashtun tribes, criminal organizations, militia forces and government officials from Pakistan, Iran and even Afghanistan sometimes cooperate with the insurgents. The largest and most powerful group is the Taliban, though they have only limited influence over other groups. The leaders of many insurgent groups are united by a common hatred of U.S. and allied forces, as well as opposition to President Hamid Karzai’s government, which they view as having sold out to Western infidels. But they have very different ideologies and support bases. Some, like al-Qaeda, have a broad global agenda that includes fighting the United States and its allies (the far enemy) and overthrowing Western-friendly regimes in the Middle East (the near enemy) to establish a pan-Islamic caliphate. Others, like the Taliban and the Haqqani network, are focused on Afghanistan and on re-establishing their extremist ideology there. Foot soldiers join the insurgency for a variety of reasons. Some are motivated by money. “Some insurgent groups pay better than we do,” one U.S. soldier in the southern province of Kandahar told me recently. “It’s basic economics.” In some areas, he said, the Afghan National Police and Afghan National Army pay recruits roughly $100 per month, while the Taliban have paid $150 or more. Others are motivated by tribal rivalry or are coerced by insurgents, who sometimes threaten villagers or their families unless they cooperate. This entry was posted on Friday, February 20th, 2009 at 4:00 am	and is filed under Best practices, Design, General, Geography, Mapping, Mountain Carto, Print, Promote. You can follow any responses to this entry through the RSS 2.0 feed. Both comments and pings are currently closed.